Alison Sudol is in disguise. In fact, she's in the disguise: the classic horn-rimmed glasses, fake nose, and mustache mask. Tonight she's just enjoying Halloween in her hometown of Seattle, but for Sudol, the 22-year-old pianist and singer/songwriter behind A Fine Frenzy, taking on a new identity--in her case, a clever band name drawn from Shakespeare's A Midsummer Night's Dream--allows her the freedom to pursue her melodic brand of confessional songwriting, with just enough of a buffer zone to keep her true self intact. It's not a bad survival technique for an artist who lays her heart on the line in every song. Sudol's "Almost Lover," for example, among the most immediately affecting tracks on her breakthrough album, One Cell in the Sea, was written when Sudol was just 19. Yet its wistful tones of regret, with somber lines like "Goodbye, my hopeless dream," sound like the work of an older and more world-weary performer, even if its brave vulnerability could only have come from someone young enough to allow the outside world to eavesdrop on her most personal reflections. According to Sudol, the experience of writing "Almost Lover" was deeply unsettling, though it ultimately encouraged her to follow her muse even more vigorously. "'Almost Lover' came a couple of years before all the other songs on the album," she recalls. "It was the first song I had ever written entirely on my own, and at the time, I could barely play the piano. But I had something in my life that I needed to make sense of, and it all came pouring out in that song. It was intense. I had a breakdown, basically, because I thought, 'This is as honest as I can be, and if people don't get it, maybe I shouldn't be a songwriter at all." Then it comes to A Fine Frenzy, people are most definitely getting it. VH1 certainly got it when they named her a "You Oughta Know" artist, as did the producers of the acclaimed film Dan in Real Life, who paired her with Norwegian songwriter Sondre Lerche for an appearance on the film's score. Tours with Sean Lennon, Rufus Wainwright, and Brandi Carlile, as well as airtime on TV shows such as Gilmore Girls and One Tree Hill, suggest that Sudol's well-honed songcraft, soaring voice, and lyrical piano playing continue to make converts across the board. I'm a Yamaha girl. I'm really snotty about it, too! 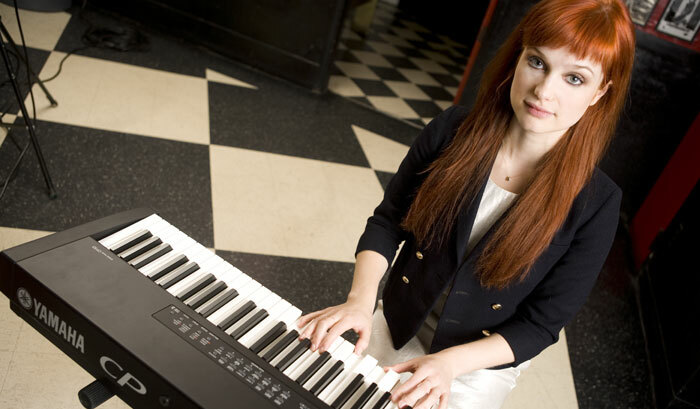 Sudol has a particular appreciation for the instruments that have helped jumpstart her creativity and career: Yamaha pianos and keyboards, especially her CP33 Stage Piano. "I've always gravitated toward Yamaha pianos," says Sudol, "and the CP33 is very special. As somebody who only really learned to play quite recently, it's difficult for me to play an electronic keyboard in the first place. In most cases, the sounds aren't authentic enough, and the feel is usually way off. But the weight of the keys on the CP33 is perfect. It feels good, not rubbery or flimsy, and I can really lay onto the sustain pedal--it can take it, and still retain its clarity." Sudol is particularly fond of the CP33's "Piano 1" voice. "'Piano 1' sounds like a beautiful old piano, period," she says. "People in the audience argue over whether it's 'real' or not, because we sometimes keep it inside an upright piano shell that's had all the strings taken out." Previously, Sudol relied on the Yamaha P250 Digital Piano, which she "loved because of the great weighted action," but it became a bit heavy for touring, as Sudol travels with a road crew of only one. Of course, the CP33 doesn't tell the whole story: Like many confessional songwriters, Sudol admits that the experience of communing with an acoustic piano lends itself to a brand of inspiration that's hard to get elsewhere. "At the end of the day," she explains, "my favorite piano is always an Yamaha upright. They just seem to have songs in them. I was in a hotel the other day, and they had a piano in the lobby. I opened it up and--thank God--it was a Yamaha. Yamaha pianos never sound tinkly or woody. They always have a really nice warm sound. That's why I'm a Yamaha girl. I'm really snotty about it, too!" Sudol has parlayed her love of warm-sounding tones into a heated yet effortless style that lifts songs like "Come On Come Out" and "Hope for the Hopeless" into the kind of stirring, piano-driven buoyancy that listeners might expect from Coldplay, Keane, Sarah McLachlan, and Tori Amos. It's hard to miss the Coldplay influence in the clockwork strings, echo-y guitars and insistent piano clusters of "You Picked Me." But Sudol's voice finds gorgeous resonances, dramatic dips and trills, and swooping falsettos that mark her as a singer of rare distinction. "For me, singing came years before the piano," says Sudol, whose mother, a theater arts teacher, nurtured her on a steady diet of Ella Fitzgerald, Elton John, and Romantic-era classical music. "I'm a completely self-taught pianist. There was a piano in the house when I was a kid, and then later on, in my Dad's girlfriend's house. I would come up with chords even though I really had no idea what I was doing. I'd just feel my way through. But truth be told, I would generally write songs using just my voice, or I'd write with someone who played an instrument. I'm not sure why, but I simply refused to play the piano seriously. I had a particularly horrible piano teacher as a kid, so maybe that's what spoiled me for a very long while." That admitted "awkward stage" came to a graceful end when Sudol collaborated with a fellow songwriter who began to explain the process of arranging chords and melodies, inspiring Sudol to find her own way around the piano. 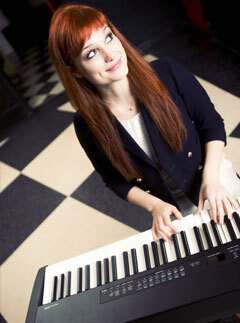 But even when her father gave her a piano at 17, she was still two years away from really digging in. Nonetheless the songs started coming, first as vocal melodies and then as basic chord changes that she fleshed out on the piano. Eventually, Sudol began working with simple I-IV-III and I-II-V patterns, searching the keys to find harmonic movement that represented what she was hearing in her head while still allowing serendipity to play its part. "I don't sit down with any ideas about lyrics or melodies at all," Sudol says. "There's just something that happens when I play a chord. The mood and the melody and the other elements come together and just explode into a song. Somehow, in the combination of things, something gets lit on fire. I can never quite figure it out. It's as if my head is full and it needs to come out, but there's no planning ahead of time. Sure, I write things down all the time in a notebook, but I never use them. It's all about what the chords are saying; then the words just flow. In fact, the more I try to clamp down on an idea, and try to find a thread, the more the original idea dissipates." As for many songwriters, that free flow is just the beginning of the lyric writing process. Sudol works from her initial improvisations, refining the words until an underlying theme begins to shape the work as a whole. She's not averse to hanging onto lyrics that may seem cryptic at first blush. "If you speak plainly all the time, it can be quite boring," she states. "And yet you don't want the language to be nonsensical. For me, it's the combination of poetic language and plainspeak that makes things beautiful, like the way [English novelist] Thomas Hardy writes. Of course, you don't want to get so much inside your own head that everything comes out self-absorbed and pompous." She laughs. "Though that can happen, too!" At the heart of Sudol's compelling artistry is the relationship between literature and sound. She cites the work of classic British writers such as C.S. Lewis, E.B. White, Lewis Carroll, and Charles Dickens, writers whose ability to conjure alternate realities have made them rich sources of inspiration for young artists in virtually every discipline. On Sudol's MySpace site (myspace.com/afinefrenzy), fans can read "A Fine Frenzy: The Story," a quixotic, Carroll-esque tale of a girl who "lived her life looking through the wrong end of a telescope." The piece is an excellent example of Sudol's deft prose and dreamlike sensibilities--though she's a also fan of less frilly fare, including author Ayn Rand's novels of self-determination, Atlas Shrugged and The Fountainhead. The author and protagonist of A Fine Frenzy will have plenty of time to read--and listen to current musical favorites such as Sufjan Stevens, Philip Glass, and Aphex Twin--as she sets off on another tour with Brandi Carlile, then jets to Europe for still more dates this winter. After that, she plans to hunker down and get back to her pen, paper, and piano. This time though, she'll be adding a Yamaha Motif Rack ES module to her toolbox. She says she's anxious to delve into its expansive library of sounds. "It's important for me to continue to make music, even if no one hears it," she notes. "I believe that in all forms of art, it's doing what you feel that matters. It's the one thing that can make you better than someone who has had years of classical training."